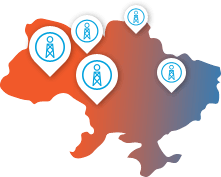 “Unconventional Gas in Ukraine” Project highlights technical, environmental, economic, and other issues of unconventional hydrocarbons extraction, including shale gas, tight sands gas, deepwaters gas, coal bed methane etc. The term “unconventional” here refers to the location conditions and extraction methods of the hydrocarbons, which are considerably different from the “conventional” ones. The chemical composition of conventional and unconventional hydrocarbons is practically identical; thus, unconventional and conventional natural gas is the same methane – CH4. High prices for hydrocarbons, exhaustion of conventional hydrocarbons’ reserves, the use of hydrocarbons as an argument in international relationships push for the development of unconventional hydrocarbons. Around half the US natural gas supply already comes from unconventional natural gas, shale oil projects are booming in Russian Federation, unconventional gas projects are being actively developed in Canada, United Kingdom, Poland, Turkey and Ukraine. Since the development of such projects may have a substantial influence on the environment and social habitats, all our best must be done to ensure, when possible, the sustainability of the energy supply. Thus, media, local communities, politicians, state officials, and industry are welcomed to share their views regarding unconventional hydrocarbons at our website. The Project is run by LLC “KT-Energy” (www.kt-energy.com.ua), the consultancy on non-traditional energy and carbon emission reduction projects.